The appearance was scheduled to take place at the planned police accountability forum, at the Congregation Sherith Israel on California Street. San Francisco police Chief Greg Suhr cancelled a planned public appearance with Public Defender Jeff Adachi Tuesday evening after a day of protests calling for his job. "Security concerns were expressed to the organizers and they made the decision to cancel," police officials said in an e-mail. The forum on police reform still took place even without Suhr. Earlier in the day, a group of hunger strikers marched to San Francisco City Hall to protest police brutality and what they describe as rampant racial bias in the San Francisco Police Department. Chanting, "How do you spell murder? 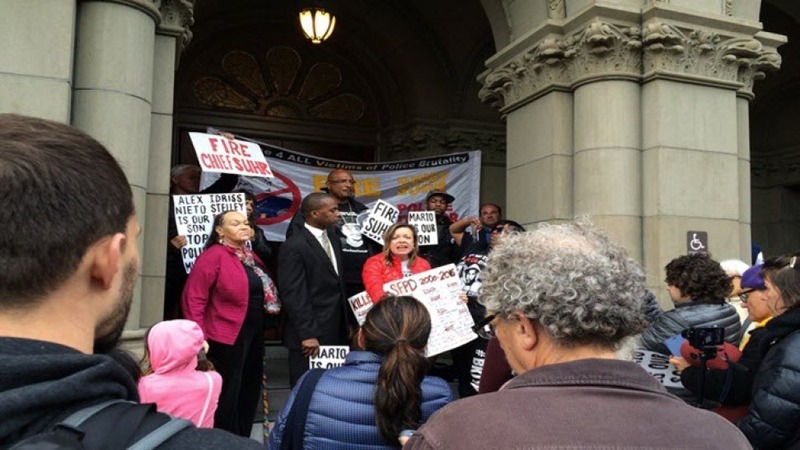 SFPD," and "Fire Chief Suhr," the #Frisco5 as the hunger strikers call themselves, marched from the Mission District to Civic Center, demanding Suhr step down or be fired over recent controversial police shootings. The hunger strikers, some in wheelchairs, gathered outside Mayor Ed Lee's City Hall office, demanding to meet him, raising their fists and chanting, "Power to the People." The group also stopped at the intersection of Market Street and South Van Ness to sing for change. However, the protesters were told that Lee was in the Bayview District and couldn't get back to City Hall immediately. They spoke with San Francisco city supervisors, demanding answers. "You guys gotta show us that he isn't unstoppable ... make something happen before I make something happen," a protester told supervisors. "It took a hunger strike to make me feel alive in a city that feels dead," San Francisco-native Tony Robels said. "San Francisco is so racist, they stopped believing racism exists," another protester said. The steps of City Hall were filled with hundreds of people singing and chanting "No justice, no peace, no racist police." Police at one point estimated about 400 to 500 protesters, but the scene at Civic Center indicated many more. Before the start of the march, the Frisco 5 were blessed in the Mission District with holy water. On Monday, the protesters snubbed Lee outside a San Francisco police station. The strikers refused to meet the mayor, who they said didn’t come outside to speak to them. Instead, Lee stayed inside the building for roughly 30 minutes, displaying what one protester called a “blatant disregard” for the activists. The ongoing strike is fueled, in part, by the Dec. 2 fatal police shooting of Mario Woods in the Bayview District. Video of the shooting circulated widely on social media, fueling public controversy over police use of force. Strikers leaving @sfbos meeting, Gutierrez says they've said what they had to say. They want Ed Lee.